Le Pater, Alphonse Mucha’s Masterpiece of Symbolism- A love letter to the close of the 19th century and a message of hope to the future. We launched a Kickstarter campaign on Easter Sunday to fund the printing of this book, and in less than 48 hours our initial goal was met and surpassed! We are thrilled at the passionate response from art lovers worldwide, and with 13 days left of the campaign we hope to get this book into the hands of as many people as possible. Please help us spread the word by supporting the project with a pre-order and giving it a signal boost if you know others with whom this will resonate. By December 20, 1899, Alphonse Mucha had experienced four years as the most recognizable proponent of Art Nouveau graphics and the most celebrated illustrator in Paris. The massive output of the artist in his first four years in the advertising and decorative world earned much for Mucha’s publisher but very little for the artist himself. As the end of the century grew near, Alphonse Mucha insisted upon the release of a deeply personal work, and printed 510 copies of what he for the remainder of his life considered his works-on-paper masterpiece, Le Pater. Decidedly non-denominational, Mucha’s exploration features a female deity protecting humankind and a number of sophisticated occult themes across a series of images of mystical illustrations. Mucha’s previous artworks were lithographed on numerous mediums ranging from paper to silk, in multiple formats; Mucha’s publisher Champenois saw that Mucha was the most printed artist in Paris in the late 1890s. 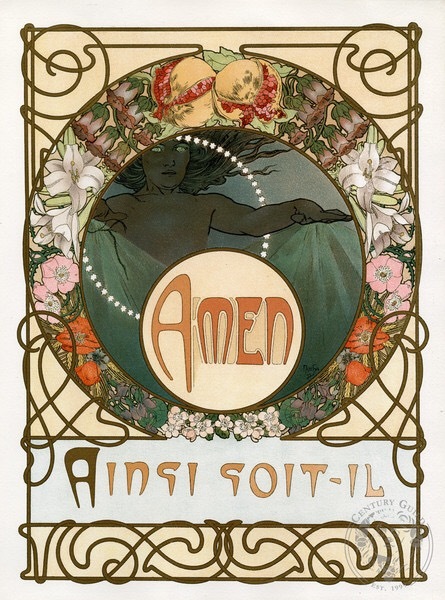 Mucha’s concern, understandably, was likely that the imagery of his spiritual work would be capitalized upon. By 1899, he had earned the right to demand that the Le Pater images would be produced in an edition of only 510 copies, and subsequently saw the plates destroyed- ensuring the work would never be reprinted for mass-market purposes. The images from Le Pater are mentioned in numerous Mucha books as his masterpieces and are universally acknowledged alongside his massive Slav Epic paintings as his finest work. However, as a result of Mucha’s forced limitation of the publication of this masterwork, the rarity of the lithographs means that most books are limited to mentioning the images in the text and leaving the reader to wonder what these “lost masterpieces” might look like. The original promotional materials for the Le Pater series name these artworks as of “rare interest and considerable importance”. Over 115 years later, the description continues to ring true. HOW CAN I HELP MAKE THIS HAPPEN… and SEE THESE ARTWORKS? If you’d like to see all these artworks in one book, captured in high resolution from the originals… Please support our project and pre-order the book! You’ll also be receiving special Kickstarter-only rewards and helping create the public exhibition of a selection of the original works on paper happen in Los Angeles from July 22nd through August 20th, 2016 – just in time for Mucha’s July 24 birthdate! This entry was posted on 30 March, 2016 at 5:03 am and is filed under Uncategorized with tags alphonse mucha, books, kickstarter. You can follow any responses to this entry through the RSS 2.0 feed. You can leave a response, or trackback from your own site.